CoQ10 is required to convert fats and sugars into usable cellular energy. Super Ubiquinol CoQ10 with BioPQQ® contains three key nutrients to boost energy production at the cellular level. 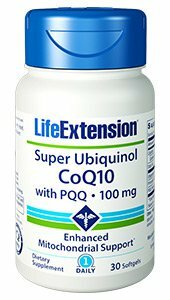 Super-absorbable ubiquinol CoQ10 absorbs better and remains in the bloodstream longer than regular CoQ10. More people are supplementing with CoQ10 than ever before. A key reason is increased awareness that the body's production of CoQ10 declines significantly with advancing age. Statin drugs also deplete CoQ10 levels in the body. For an extensive review of all the benefits of CoQ10, see my ARE YOU LOW IN COQ10? newsletter. PrimaVie® shilajit is a nutrient that has been shown to double levels of CoQ10 in mitochondria. Combining CoQ10 and shilajit produced a 56% increase in energy production in the brain 40% better than CoQ10 alone. And in muscle cells there was a 144% increase in energy production 27% better than CoQ10 alone. Shilajit itself is rich in compounds that help the mitochondria convert fats and sugars into ATP (adenosine triphosphate), the body's main source of energy. Promotes mitochondrial biogenesis. PQQ activates genes that promote the formation of fresh mitochondria. It also beneficially interacts with genes directly involved in mitochondrial health. These same genes support healthy body weight, normal fat and sugar metabolism and youthful cellular proliferation. Mitochondrial defense. Mitochondria possess their own DNA, distinct from those contained in the cell nucleus. Unfortunately, compared to nuclear DNA, mitochondrial DNA are relatively unprotected and yet situated at the source of both energy and free-radical production. PQQ's antioxidant potency and favorable gene expression profile act to support mitochondrial defense. Antioxidant power. PQQ is a potent antioxidant. Its extraordinary molecular stability enables it to facilitate thousands of antioxidant reactions in the mitochondria without breaking down for maximum antioxidant and bioenergetic support. The cellular energy support these nutrients provide benefits your heart, brain, kidneys and all the other cells in your body which require high levels of energy to function properly.